This one pot lasagna features everything you love about lasagna without the grains or dairy! It’s the perfect one pot meal for a busy weeknight that the whole family will love. It’s paleo, whole30, AIP, and keto friendly. Growing up in an Italian family, I know how serious lasagna is. I grew up in New York, lived in Italy for a stint during college, and both my dad and my husband are serious lasagna lovers. Whenever we had any type of gathering at my house, my mom would cook massive trays of lasagna for everyone to enjoy, and my family would eat leftovers for days. Trust me… I know lasagna. So, when I told my husband that I was going to make a paleo lasagna he didn’t think I could pull it off without the hallmark ingredients of a lasagna. “No grains? No cheese? How is it even lasagna?” I swear he was borderline offended when he saw this dish and I called it lasagna. He scoffed at it and didn’t want to try it… until I wound up having to spend most of the weekend out of the house and he was left alone with it. That’s when I got the text… “okay, this really does taste like lasagna”. Ding ding ding! 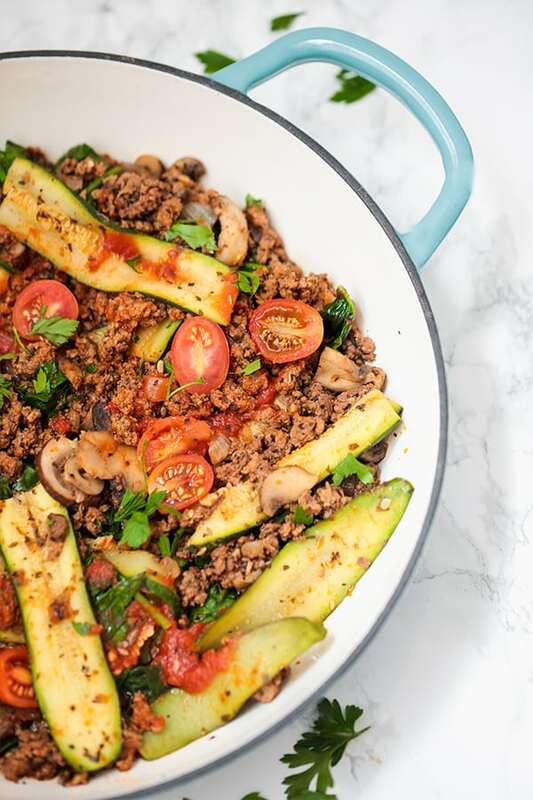 If the biggest lasagna lover in my life loved this dish, I knew I had a winner with this paleo one pot lasagna! It’s paleo, whole30, keto, and AIP with modifications. Not counting those in the sauce! 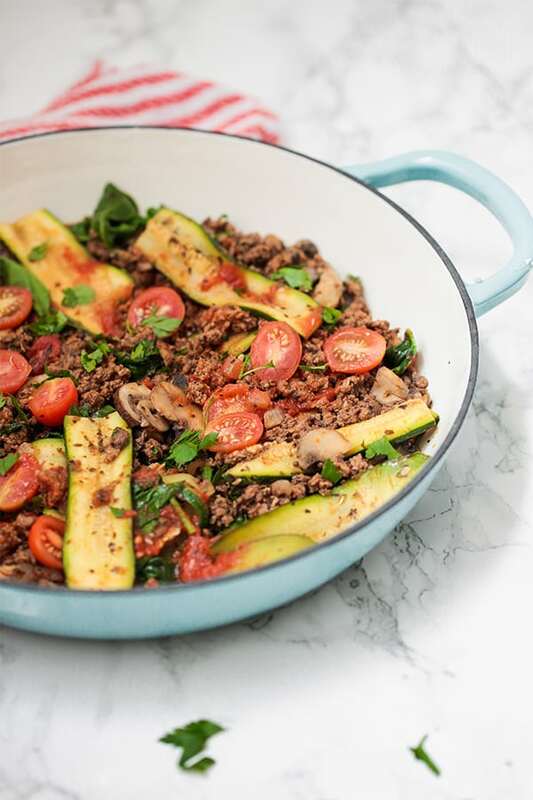 Veggies and protein with healthy fat all in one meal that’s made in one pan? Heck yes. It’s so perfect for a quick one pot dinner when you’re looking to make something yummy without the fuss. It’s also great for storing in containers for meal prep. High-Quality ground beef with a high-fat content gives this the most lasagna flavor. You’ll slice two zucchini’s into long slices to create the feeling of lasagna noodles. You can use a mandolin slicer, or even just a good vegetable peeler! More veggies to up the nutrient content! I use this or this to keep it AIP. If you’re Whole30/keto, use something like this to keep it sugar-free. This ups the lasagna factor even more. Chop the ends off of the zucchinis, and use a mandolin slicer or a peeler to slice the zucchinis into long, thin strips. Pat them down with paper towels to remove excess water and set aside. Use a large, deep skillet to brown the ground beef. Season with 1/2 tsp sea salt, and set aside and drain excess fat when cooked. Add the oil to the pan and heat. Cook the onions and garlic in the same pan on medium heat until the onions are translucent. 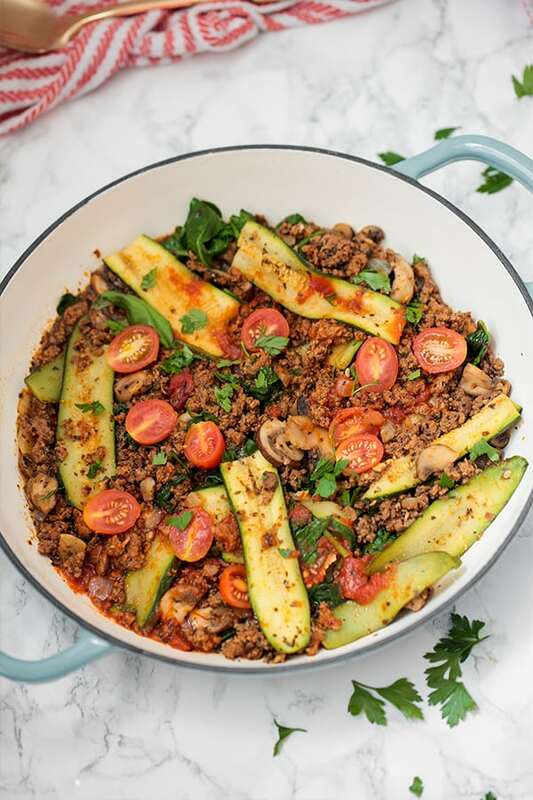 Add in the mushrooms, zucchini slices and saute for 4-5 minutes or until soft. Add back in the ground beef, as well as the marinara sauce, and the remainder of the seasonings. Cook for a few minutes to combine the flavors, and stir in the spinach at the very end. Stir until the spinach has wilted. Top with sliced grape tomatoes (omit for AIP), extra seasoning to taste, and serve! I don’t have kids yet. However, I very much want them soon, and on some days I very much want to be one of them again. I loved kid food when I was a kid. Chicken nuggets, fruit snacks, and mac and cheese were most of my diet, and it showed as I got older and sicker. Though I’m not a parent myself, and can’t imagine how hard it must be to keep your kids away from these foods 100% of the time, I believe that there are was to make real food based kid friendly swaps to make everyone happy, including your inner child 😉 Because let’s be real, sometimes I really want to eat like a kid again! After some really long hard days, I’d rather just have comfort food than roasted veggies. So, I decided to marry real food with comfort food with these baked veggie nuggets that are paleo, gluten free, grain free, dairy free and autoimmune paleo friendly! My favorite thing about these veggie nuggets is that they’re egg free! Not only do we all need egg free recipes on the AIP, but I know tons of kiddos who are egg free these days. It’s one of the most common allergies with little alternatives when we look at processed foods. When I was just gluten free and not AIP yet, almost every store-bought gluten free processed food had eggs in it. As I realized how much egg whites were harming my gut and my health, I needed alternatives fast. These nuggets have a gelatin egg in place of a real egg, and the tapioca starch also really helps bind them! When I was a kid, I wouldn’t come within 10 feet of zucchini. Even as an adult, it takes a lot of work to separately prep all of these veggies. So, I love that these nuggets are packed full of all of these nutrient dense veggies! It’s recommended that we consume 8-9 cups of veggies a day, and these nuggets have 2.5 cups in total! Not bad for a nugget, huh? As for dipping, I ate these nuggets with an easy AIP guacamole, and couldn’t stop! However, they’d also taste amazing with a compliant ketchup or ranch dressing. I’m drooling just thinking of having these with either! My husband actually eats them with mustard. It sounded weird to me at first, but he swears by it! He says it makes it taste like a corndog 😛 Honestly, a bit of a stretch in my opinion, but it makes him eat more veggies! They’re best fresh out the oven, and I don’t love putting them in the microwave. If you choose to reheat them, I recommend going for the broiler. It’ll help them crisp up without drying them out! If you love these veggie nuggets… you’ll also love these fun nuggets! Asian Chicken Poppers, Breakfast Sausage Poppers and the Sweet Potato Chicken Poppers! Let me tell you a story about a little girl who literally ate zero animal protein until she was about 20 that wasn’t in chicken nugget form. She was so unhealthy and out of touch with her bodies innate intelligence to eat real food that she would gag at any protein that wasn’t a nugget. She did not discriminate when it came to nuggets… dinosaur shaped, fast food, frozen, they were all her favorite. It wasn’t she grew up, was diagnosed with Hashimoto’s and gut issues, and actually got a firm understanding of her health did she realize that those nuggets were not the best choice. So… clearly, I’m talking about myself here. Maybe dinosaur shaped chicken nuggets weren’t my friend then or now, but these chicken poppers are the real food, adult version of the chicken nuggets that I loved for years! They’re paleo and Whole 30 friendly, and even strict autoimmune protocol friendly for all of my fellow autoimmune healers out there! Plus, they are the perfect food for dipping! I may or may not have already nicknamed this “dippy chicken” (because I’m mature), but really… it’s the perfect size for finger food and tastes great dipped in a big bowl of AIP guacamole! Feel free to use a different sauce that is compliant with your own needs, like maybe a clean buffalo sauce, or even a ranch dip. But rest assured that they go great with this guac! I also have to shout out a similar recipe, chicken and zucchini poppers from One Lovely Life! These are another great option if you’re looking for something lower in starch. Combine all of the ingredients in a large mixing bowl and thoroughly mix. I hope you absolutely love these poppers are much as we do here at the Hoover household! If you love the sweet potato chicken poppers… you’ll also love these fun variations! Asian Chicken Poppers, Breakfast Sausage Poppers, and the Bacon Ranch Chicken Poppers!